Anairda is currently collaborating with The Alternative initiative - an independent platform with a different perspective to re-create politics: they visit places and use a series of events to spark public conversation and community decision-making via "political-creative laboratories", where they trust artists to trigger the conversation. Anairda will be suporting the facilitation process at their first event in Plymouth called "South Devon Friendly" on Tuesday 12th June. Join us! The new short film of artist Betshy Sanchez-Marrugo where Anairda was invited to participate performing and being interviewed, can be seen now on YouTube! 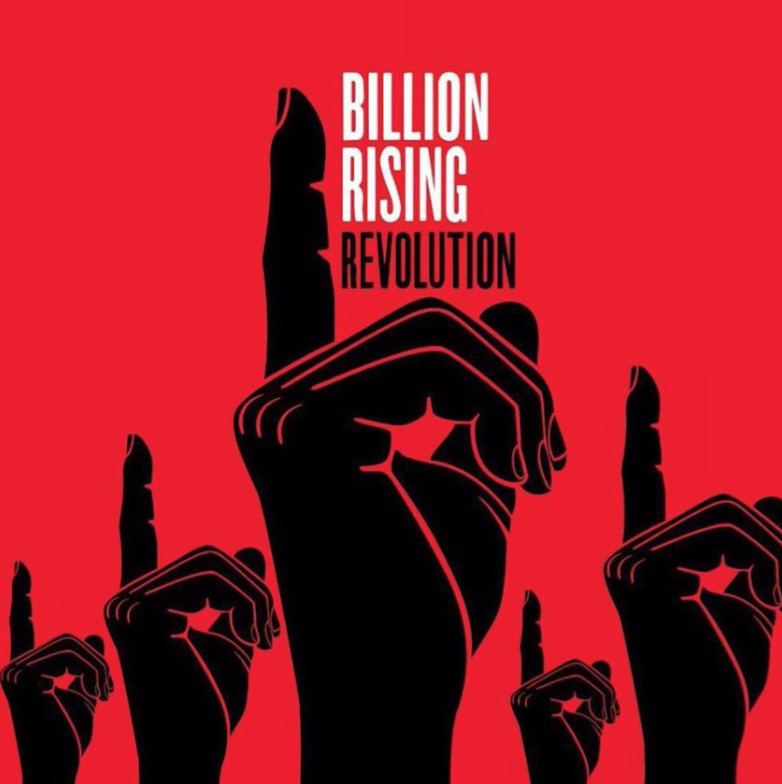 The video explores the concept of challenging the establishment and the connections between this and the arts. Betshy is directing and producing a short documentary about "Challenging the Status Quo"
Follow Anairda on facebook to know when the video is out and her coming performances! The opening day is on Sunday 3rd September, 12noon at Lost Rivers Elephant. knowledge, impart wisdom and make a difference. followed by a public discussion. See details here. backgrounds - 10th - 13th August. Join in! Anairda & The Anarkistas at Vegfest! 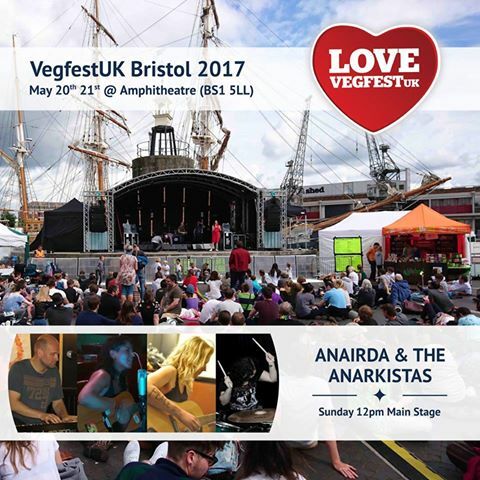 Anairda's band has been kindly invited to perform at the Main Stage of the amazing Bristol Vegfest! on Sunday 21st May, 1pm. 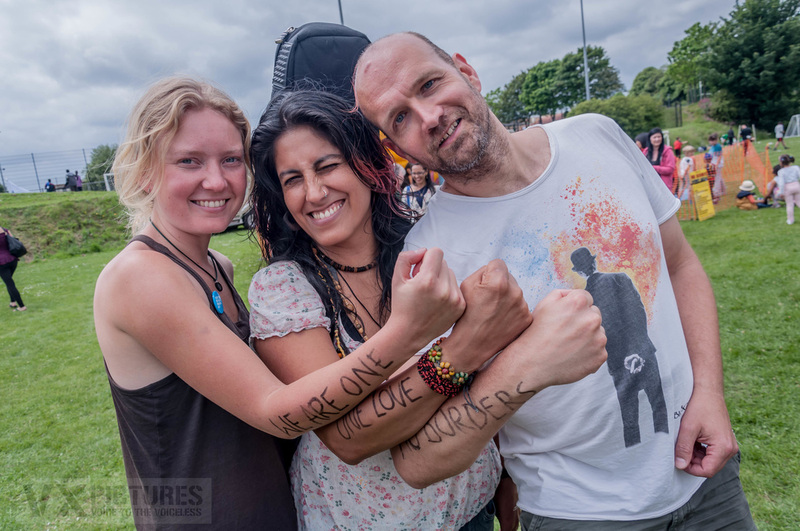 The Vegfest is an renowned annual festival to celebrate veganism and the vegan way of life, and includes campaigning stalls, caterers plus complete timetables of speakers, cookery demonstrators, entertainers and performers from all over the country. An event for the whole community! 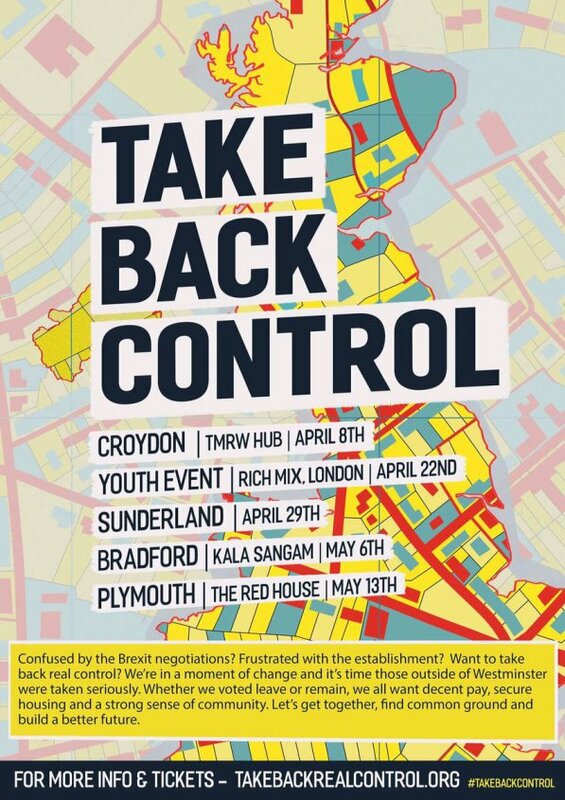 Panelist at "Take Back Control"
conversation possible here. Come and support the dialogue! for their next long gig at the Bread & Roses pub, on Monday 20th March, 8:30pm. Both events involved socially engaged arts. Don't miss them! This will be the first full length gig of the band, with a repertoire of their old and new socially-engaged songs, featuring their new percussionist Shannon Green. Get to know more details and join their gig: here! The Plymouth Art Weekender is an ambitious three days event during September to celebrate Plymouth, its people and the arts, promoting the city as an exciting contemporary art destination. Anairda was invited to Red House Radio, a community radio studio run by students, to speak about her project Feminist Fusion and her own art. Hear the interview here. Creative Collective Synergy﻿﻿ is an online collective of artists that uses spirituality, art and political reflection to challenge the system and spread consciousness. You can read Anairda's interview here. Anairda and her new ensemble have been invited to play at the ﻿Love Diversity﻿ community event - a special fun day that will be the closure of the Plymouth Hate Crime Awareness Week 2016. The event aims to celebrate and promote community diversity and kindness to change perceptions and educate about the diversity of our world. 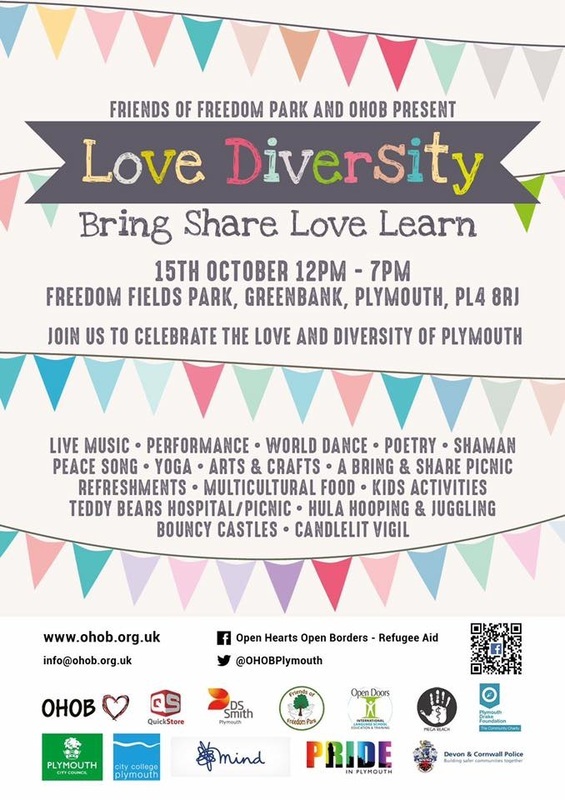 Love Diversity will happen on Saturday 15th October and it will include live music, family activities, crafts, hula hooping, juggling, poetry, bouncy castle, face painting, multi cultural food and more! And don't forget to follow Anairda & The Anarkistas on their brand new facebok page!! Plymouth Art Weekender is a new initiative in its second year to promote and support arts in Plymouth by exhibiting a variety of exhibitions, performances, discussions and other proposals from local artists during a whole weekend. Anairda is participating with a special session of Feminist Fusion dedicated to Black Feminism, with extraordinary guests like the author Abimbola Alao and writer Joanna Traynor, on Saturday 24th September, 7pm at the Plymouth Athenaeum. A great art weekend for the city! 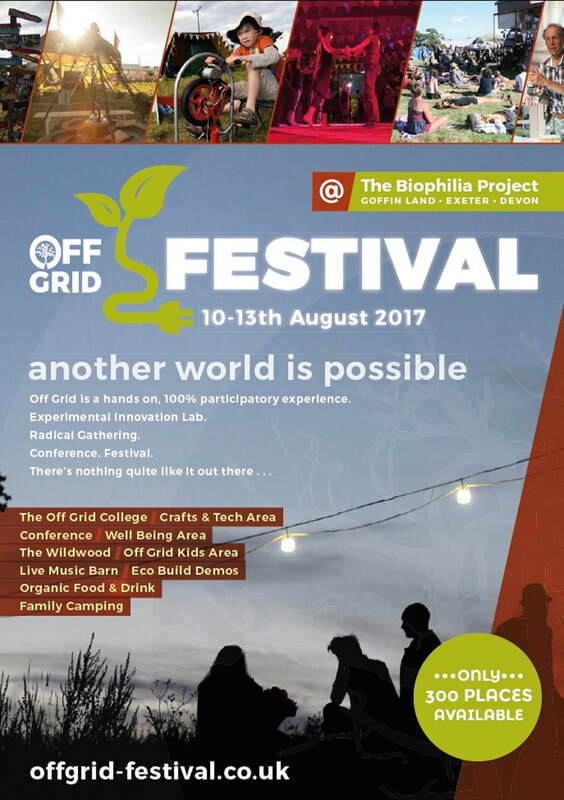 Anairda will be contributing this summer to the Off-Grid festival 2016, an important local initiative to explore community, creativity, ecology and consciousness to change our world. 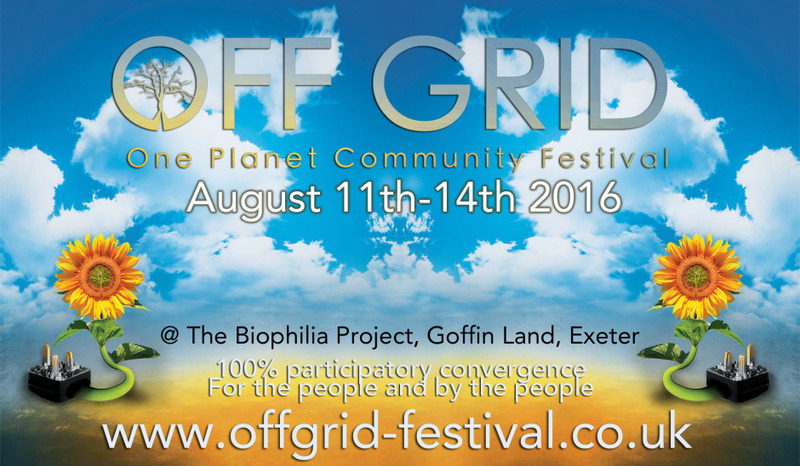 She'll be taking her workshops "Art & Social Change" and "Re-connect" to the great Biophilia Project in Exeter, where the festival is based this year. Tickets are still available! 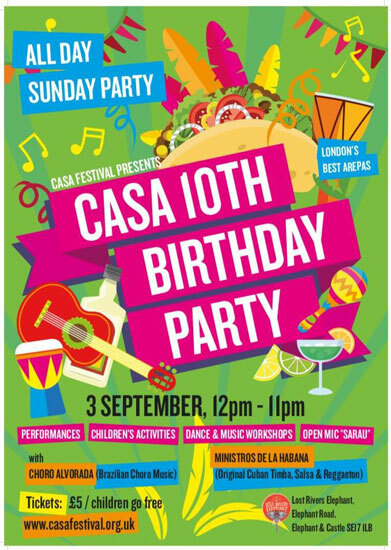 Come and support a positive space in these critical times of climate crisis - from 11th to 14th August. After a fun go-round performing at various local pubs and events Anairda & The Anarkistas have been invited to play as opening act for their colleague Ukulele Vagabond, at the Cider House in Plymouth, on Friday 22nd July, 7pm. This special evening will have a Hawaiian party theme, along with the rebellious tunes of both bands. 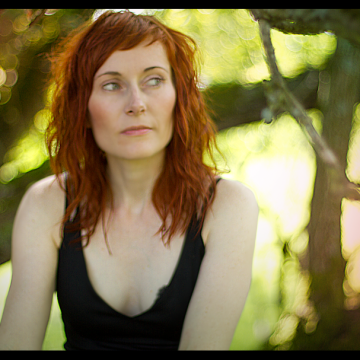 More info on past and coming gigs at Anairda's page. Don't miss it! 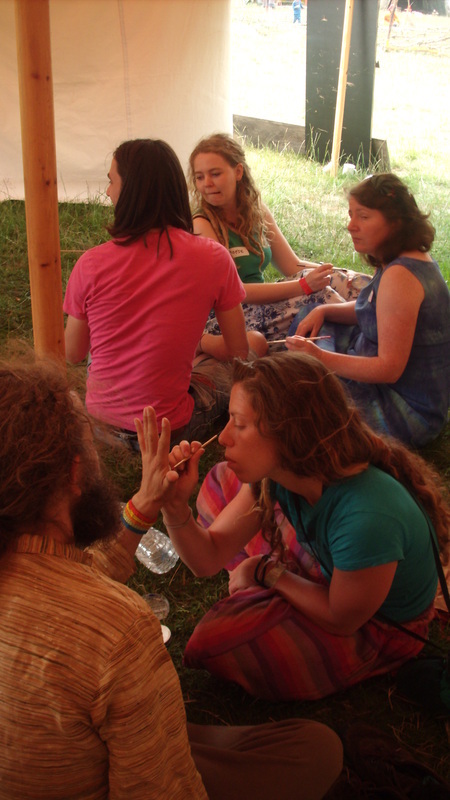 The Buddhafield Festival is a joyful and unique creation of community, ritual, song, dance, arts and crafts, yoga, t’ai chi, meditation, and play, blend together in a drink and drug-free environment. The festival is for people from all traditions — and none — coming together in a mindful and family-friendly space. 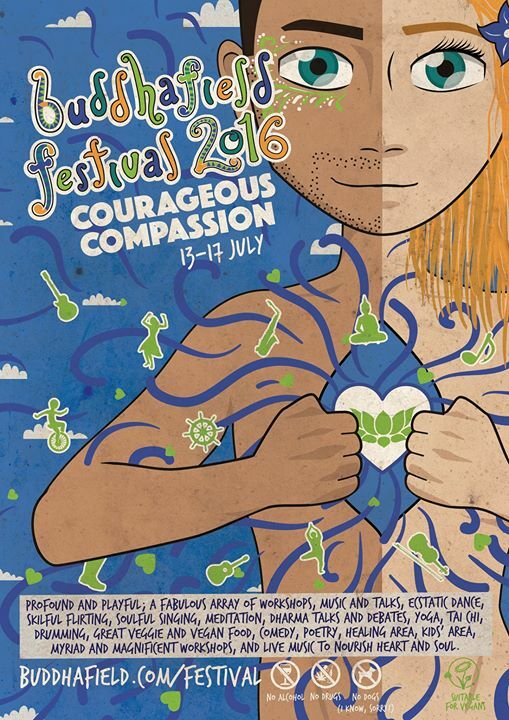 This year festival's theme "Courageous Compassion" will be part of every activity and Anairda will be engaging the topic through her workshops "Art & Social Change" and "Reconnect", plus a talk &﻿ discussion on the 2015 Friend of the Earth book "Why Women Will Save the Planet". 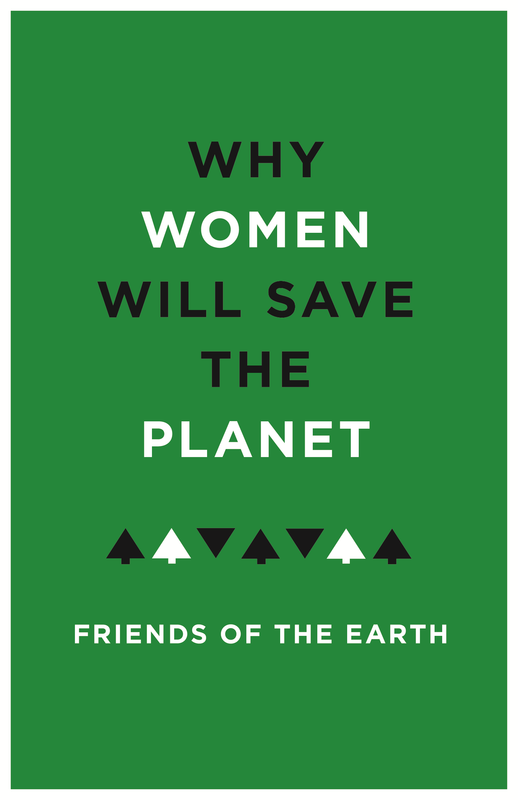 Anairda has been invited to be the guest speaker at the ﻿﻿﻿Plymouth Green Book Club,﻿﻿﻿ to discuss the "Why Women Will Save the Planet" 2015 publication by Friends of the Earth, edited by Jenny Hawley. The meeting will be from 6:30 to 8:00pm on Wednesday 6th July, room 403 of the Babbage Building, Plymouth University. FREE entry. Anairda & The Anarkistas - In The House! House Gigs are very popular in Latin America with emerging bands. Anairda and The Anarkistas (Michael Klein & Martha Nash) will be playing their first house gig, as a private event for friends next week. The night will count with some guests and it's going to be filmed into a memorable video that will be shared through their social media. Follow Anairda on Facebook and you won't miss it! Benefit Gig for animal rights! 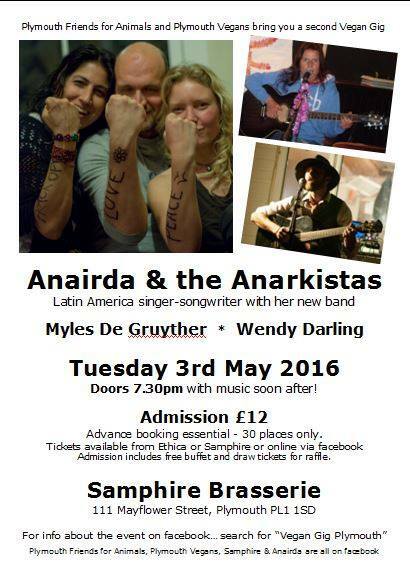 Plymouth Vegans and Plymouth Friends for Animals have invited Anairda to play at their benefit gig-dinner on Tuesday 3rd May, 7:30pm, at Samphire Brasserie. She'll be playing her songs accompanied by The Anarkistas ensemble: guitarist Martha Nash and keyboardist Michael Klein. All the money raised will go to local campaigns for animal rights. You can buy your tickets here. ... and get to now about her coming gigs, projects and comment on Facebook and Twitter! 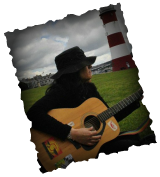 On Saturday 12th March she'll be singing at Column Acoustic, an initiative to support the Devonport community. This will be a special session to celebrate International Women's Day. Saturday 26th March, Anairda will perform at Plymouth Earth Café, a community event for networking on animal and human rights and the environment. Anairda will be the supporting act for Australian folk-pop singer songwriter Emaline Delapaix, on her first official UK 2015 tour! The concert will be a "Vegan Dinner Concert" in support of Plymouth Vegans and Plymouth Friends for Animals groups, on Tuesday 13th October, 7:30pm. You can join the facebook event to book your tickets here. Emaline and Anairda are both vegans. Singing at the Union Street party 2015! 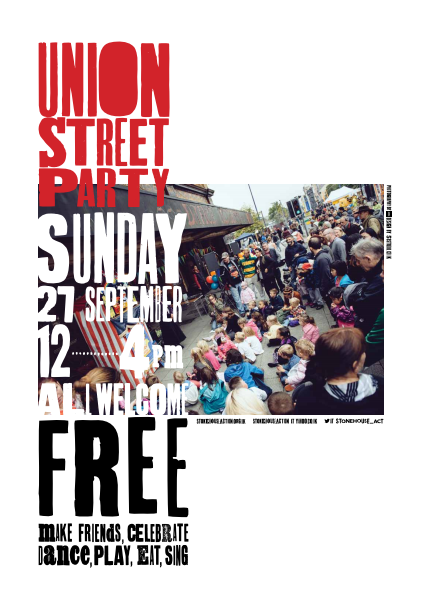 Sunday 27th September will be the 7th year of the biggest community street party in the city of Plymouth! Union Street will celebrate their neighborhood life with performances, crafts, family activities and information stalls from local community organisations. Free entry. Anairda has been invited to play at the acoustic stage at 12noon. Don't miss it! The Union Street party is a project from Stonehouse Action. 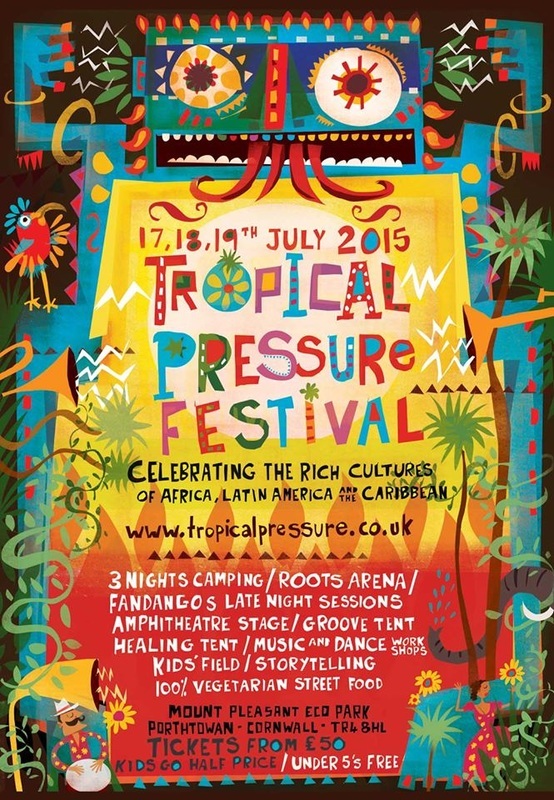 Tropical Pressure is a new regional festival on its second year, to celebrate the rich cultures of Africa, Latin America and the Caribbean, on the 17th, 18th and 19th July in the beautiful Mount Pleasant Eco Park of Cornwall. Anairda will be playing there on Friday 17th - the Latin day! - her own songs in Spanish (and Spanglish) plus some traditional social tunes from her land. ...at the CrossCountry Writers session of Saturday 11th July, 7pm, at the Plymouth Arts Centre. Anairda will share her own material in English on social topics. 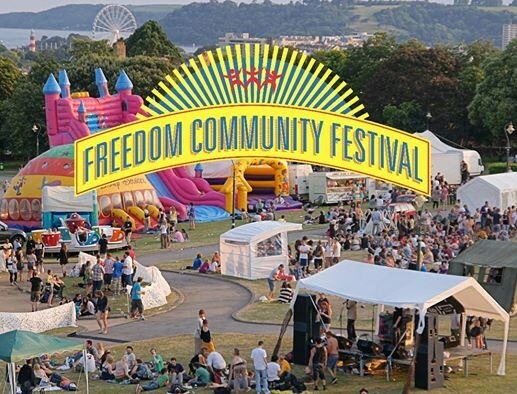 Anairda will be sharing her music at the Freedom Community Festival 2015, a Plymouth annual event to celebrate the talent and diversity of the local community, with a variety of local musicians and activities for families and teenagers. 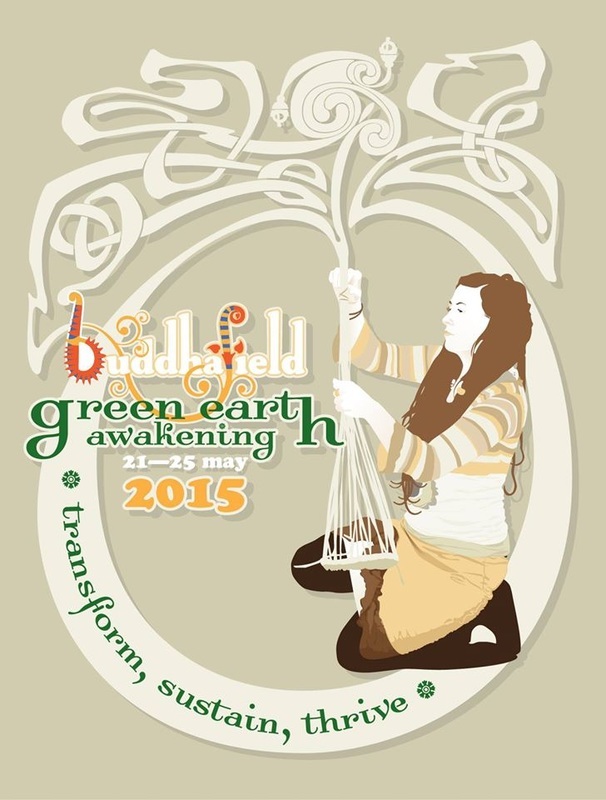 More Green Earth Awakening in 2015! Anairda has been invited again to participate at the beautiful Green Earth Awakening camp organised by the Buddhafiled community, from 21st to 25th May. The camp aims to join the dots between community, sustainability and spirituality, with a Buddhist approach. With green crafts, engaged dharma, social change, forest school, healing area and a daily timetable of workshops, talks, meditation, yoga, qi gong, dance and music. Anairda will be sharing her workshops on Art & Social Change, Creative Empowerment, Theatre dynamics and some of her socially engaged music. 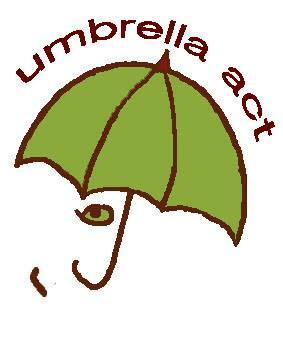 The Umbrella Act is a non-profit "Art & Permaculture" project to explore positives alternatives to consumerism and the climate crisis, using Arts. Anairda, together with the artist Hannah Gardiner, will be facilitating a free workshop for the community of Plymouth to upcycle broken umbrellas (symbol of our throwaway society) while learning and discussing Permaculture, on Saturday 18th April. There will be more workshops in Totnes, Bristol, Norfolk, Oxford, Cradley, Norwich and London. Photos of the resulted artworks will be decorating the International Permaculture Convergence in September. Anairda will be collaborating as a guest singer, with the band Tango Sonoro! Tango Sonoro is a Devon/Cornwall based band specialising in Argentine Tango and Latin Music. 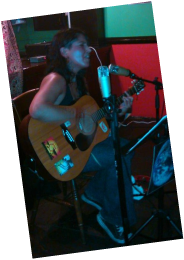 She will be singing traditional tunes in Spanish with the group on Friday 8th May, 9pm, at B-Bar of The Plymouth Barbican Theatre. Anairda is currently planning her music & poetry performances for 2015, at the same time that organising the first anniversary of her project Feminist Fusion, which has become a beloved bi-monthly community event in the city of Plymouth. The anniversary will take place on Friday 27th February, 7pm and it will bring together many of the artists who participated in this first year. The session will include live music, poetry, an open discussion triggered by a talk from psychologist and author Christa Mackinnon ...and an anniversary cake! 1st September, in Avalon fields, near Glastonbury. The new workshop creates an opportunity for the participants to explore self-empowerment and purpose through their own creativity. The Healing Area had also sound-bath healing, chakra toning and drumming workshops made by the Gateway to the Heart team and drummer Paula Thomas. 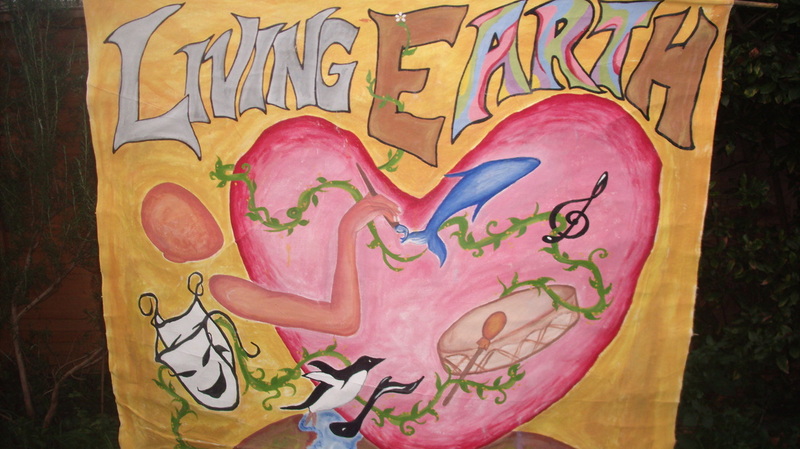 Group's ideas & poem at "Art & Social Change"
In July, Anairda was invited to deliver her "Theatre dynamics" and "Art & Social Change" at the Green Earth Awakening Camp; and an "Art Workshop for Children" at the Plymouth Racial Equality Council. The Theater dynamics made the attendees to re-connect with their body's mind through specific games. 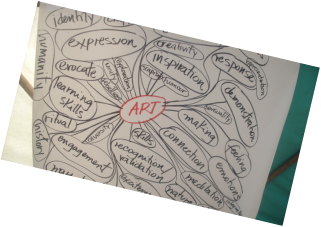 Art & Social Change is a short journey to explore people's creativity in their pursue for positive social transformation. "A wonderfully empowering workshop, creative and co-operative" said one of the attendees. "You are an excellent facilitator and I really appreciated the way you adapted the sessions to fit the changing mood of the group and to their interests and abilities throughout the day. I believe that the children came away having had fun, made friends and learnt about Respect and communication." More about Anairda's workshops here. 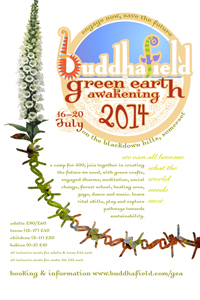 Anairda has been invited to participate in the "Green Earth Awakening Camp", on 16 - 20 July, in Somerset. She will be sharing her political music & poetry, plus her workshop "Art & Social Change" and some Theatre dynamics. The camp aims to help people to "re-connect with the land, learn vital skills, explore pathways towards a sustainable future, while providing spiritual context to empower us to change" and it's organised by the Buddhafield community. There will be live music, jamming, dance, green crafts, meditation, social change, forest school, yoga, etc. It's family friendly. in Exeter, organised by Devon United Women, on Sunday 9th March. The event will be at the Exeter Corn Exchange, from 11am until 4pm and it will include a variety of performances and speeches during the day. "I got to know that there was not going to be a big public event this year to celebrate Women's Day in Plymouth, so I made my own tribute. It was a symbolic "statue" performance on my personal connections to the different aspects of womanhood, with the solgans "my feelings matter, my cycles matter, my Mother matters." I included a clipboard for feedback but the spontaneous reactions from the people passing by was the most rewarding." Anairda will be playing and facilitating Feminist Fusion, an event in support of women's art and to explore feminist philosophies and politics. "This is an experiment, that if works for everyone participating, it can become a regular event" said Anairda. "The idea is to open a space to "fusion" different arts with philosophy/politics, in an interesting way. It also hopes to be a platform to support local artists." Feminist Fusion will be happening on Tuesday 18th February, 7pm, at The Bread & Roses community pub. It will also have the support of the singer songwriter Wendy. 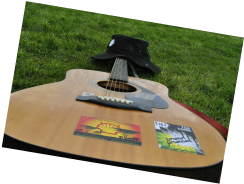 Column Acoustic EXETER is an acoustic night in Exeter city, to foster activism in its widest sense for people of all ages, from all backgrounds, through music and arts. 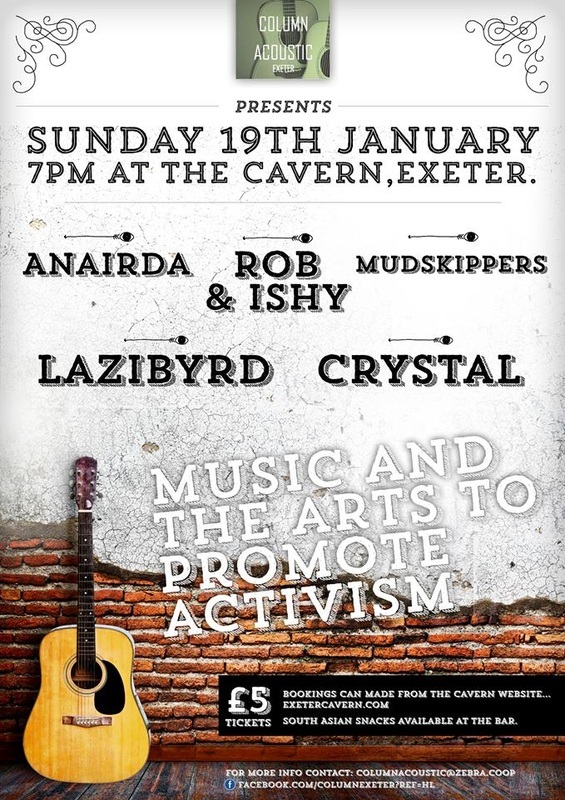 Anairda will be playing there on Sunday 19th January, 7pm, at The Cavern Club. 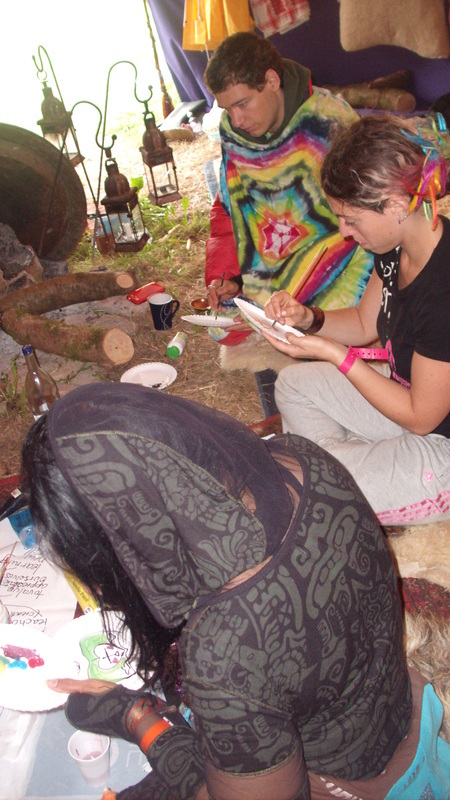 "Eco-feminism" and "Art & Social Change"
From the 17th to the 21st of July 2013, Anairda shared one of her Unkaswan workshops: "Art & Social Action" and facilitated an open discussion on "Eco-feminism" at the Buddhafield festival. The workshop was as successful as the previous year, with participants encouraged to take decisions at every step of the session. The discussion on Eco-feminism was triggered by a short film called "Ecofeminism Now". The attendees, 13 women and 2 men, explored and reflected about the different aspects of this subject. "There was a general acknowledgement by all the women present that we are needing more spaces to discuss issues that affect us directly, with a particular interest in women's activism" said Anairda, who also had prepared information flyers for the participants. 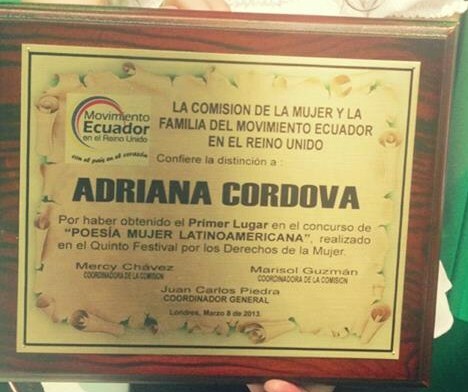 Anairda won the first prize in the National Poetry Competition "Mujer Latinoamericana"(Latin American Woman) organized by the "Women and Family Commission" of the MERU* in March 2013, to celebrate Women's International Day. Her poem "Desde las Sombras a la Luz, tu Vientre" can be read here. *MERU is the Ecuadorian Movement in the UK. Anairda is currently preparing her first "music & poetry" performances in the UK, for events during the Summer. Her work will be presented in English language, with a little of Spanish and short inclusions of other languages. She also hopes to add other "surprises". Just like the rest of her work, the pieces will explore social and ecological issues. On Sunday 25th November 2012, Anairda participated in the first march in the city of Plymouth for more and better space for Community Arts, organized by "Take a Part", a local community arts initiative. 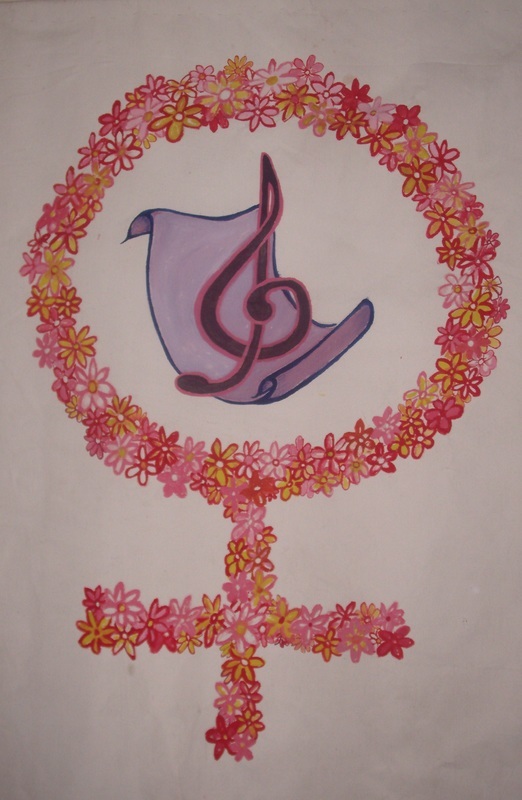 Anairda painted a banner specially for this occasion. The march counted with various local artists and it's part of a long exhibition by Take a Part called "Efford: the cultural capital of Plymouth". From the 24th to 27th August 2012, Anairda participated at the Living Arts Gathering, in Devon, offering her workshop "Art & Social Action", a "Theatre dynamics" session and an open discussion on "Art, Community & Social Change". "The gathering was an extraordinary opportunity to meet with local artists, with enough time to generate comradeship and contacts for future plans" said Anairda. "From the sessions I offered, my favourite was the 'Theatre dynamics' as they involved physical games, so you get to know the real nature of the people participating. Every session was a real pleasure among such creative people. I am very grateful to have been invited." Artists Sophia, Tasha & Jen body painting during "Art & Social Action"
At the Buddhafield festival, from the 11th to the 16th of July 2012, Anairda shared her workshop on "Art & Social Action" with the general public. Many people attending were creative people themselves. "This is a workshop that I originally structured for people who are interested in any kind of social action and would like to experiment with a more creative approach to it. My main interest is for individuals to recognize the creativity any human being naturally possesses and to feel comfortable using it for their own good cause. It is sad to heard people saying 'I can't draw' or 'I'm not an arty person'; I’m trying to transmit here that maybe not everyone can be an "artist", as that requires commitment & dedication, but _anyone can create' and our world needs more creative power rather than money power(!)" Anairda is continually structuring other workshops in the same style and seeking more opportunities to share them with the community. She hopes at some point to be able to engage them in her performances. "I loved the way things were explained and processed the easy way. Things can be easy going and flow, yet be powerful and effective" said a participant who attended the workshop. The debut of "In the World's Web"
On Saturday 3rd December 2011 at Plymouth's festival, "In The Flesh", Anairda premiered her solo performance "In the World's Web". The festival was hosted at the Barbican theatre and Anairda received a warm reception. "In the World's Web" was her debut in the United Kingdom. 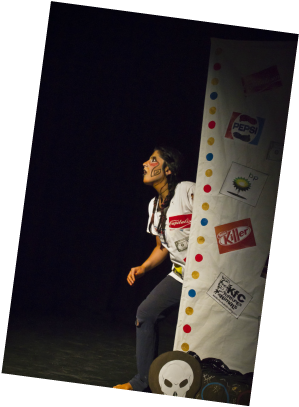 The performance takes her on a personal journey where she emerges from a consumerist society to find herself in a new dilemma; the reality of a world naturally multicultural but profoundly disconnected. The piece, that lasts around 20 minutes, expresses innocence, disillusionment, courage and humour in a journey to try to make sense of the complex world human beings have created. "The preparation for this piece was in itself a journey" said Anairda. "To direct myself after so long was a strong technical challenge. At a personal level, as my work is generated out of my body's memory, I had to review some anguish recorded there in the last years. But precisely one of the best gifts art can give us is to be able to create a space for intimate discharge, with the hope of opening, at the same time, a space for some magic and communication". "Outstanding! A firey and passionate performance which resonated with me very strongly about entrapment within and the sickness caused by a worldwide capitalist regime. Full on!" "Wonderfully evocative piece of physical theatre. I loved the myriad of ways in which the performer used her body, each carefully constructed movement offering a wealth of expression"
"Performed with such an engaging energy, the audience really felt the comedy & the frustration of the narrative." The festival "In the Flesh" at Plymouth's Barbican Theatre is designed to encourage experimentation with the live-ness of performance, uniquely it deliberately incorporates scratch ideas, work in process, large and small experiments as well as finished pieces of performance. It is the only one of its kind in the city for the last 6 years.